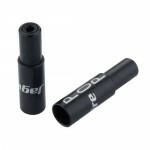 POP (Point Of Power) end caps are designed specifically for use with 5mm compressionless brake housing. This type of housing requires an end cap, but not all frames and brake calipers are built to accept a standard-size end cap. POP end caps act as a reducer, allowing compressionless housing to be used in these situations.